Second Harvest Food Bank, which serves 23 parishes in south Louisiana, developed a campaign to promote the organization, expand social media presence, and drive donations during national Hunger Action Month. Second Harvest Food Bank, which serves 23 parishes in south Louisiana, developed a local campaign to promote the organization, expand social media presence, and drive donations during national Hunger Action Month in September. PR efforts extended through its “Harvest the Music” annual weekly concert series fundraiser that ended November 2. The team incorporated elements of “30 Ways in 30 Days,” an initiative devised by national affiliate partner Feeding America, and partnered with local electric company Entergy. “30 Ways in 30 Days was perfect for social media because it gave us messages about hunger and simple ways the community could engage,” explains communications and PR director Leslie Doles. Events and media and blogger relations helped engage audiences. One way to fight hunger was posted every day in September on Entergy's Power to Care Facebook page and the food bank's website and Facebook and Twitter pages. Entergy donated 10 meals for every new like on its Facebook page between September 1 and November 1. A QR code helped drive likes. Fourteen popular local bloggers spread messaging and linked to the food bank's online properties. A building in downtown New Orleans was lighted orange (the color of Hunger Action Month) for the September 14 concert series launch. About 50 locals with large Twitter followings were enlisted to tweet messaging and attend concerts wearing an orange T-shirt displaying a hunger fact. They also distributed Power to #Fight Hunger stickers. Concert attendees were encouraged to find these people and tweet facts on their shirts for a chance to win prizes. 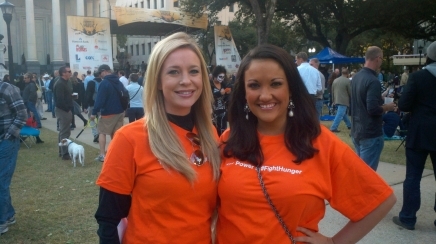 Entergy collected food at the concert series and held an internal food drive. Hard signs and antenna balls (5,000 of each) were distributed throughout New Orleans. Local media were targeted throughout the campaign. More than 10,000 meals were donated. Twitter audience reach topped 120,000 (50,000 was the goal). Cotaya says weekly tweets averaged 300 during the concert series, and hashtag #FightHunger trended organically in New Orleans four times during the campaign. About 1,200 new Facebook likes were garnered. More than 100 stories ran in local outlets. The team is developing new relationships and helping promote corporate and individual food drives.